The starkly elegant Helen Hills Hills Chapel may look like a white beacon on the hill, but in recent years fewer and fewer students have been heeding its call to attend religious services. In a campus survey this year, some 40 percent of first-year students claimed no religious affiliation at all, and weekly Protestant and Catholic services at the chapel have been attracting only a handful of students. Members of Spirituality in Action include, from left to right, Anna Culver ’11, Alicen Roberts ’12, Rachel Ravina ’12, Nathalie Ais ’10, Ilana Alazzeh ’10, Dean Jennifer Walters, Jeanne Stranzl ’11, Elizabeth Booher ’12, and Rebecca Narum ’13. Still, the chapel is a busy place, supporting numerous faith-oriented student organizations that continue to flourish—including Christian, Jewish, and Muslim groups, as well as the interfaith Spirituality in Action, the Free Thinkers, and the Association of Smith Pagans. It was in this context last year that President Carol Christ, looking for ways to cut $22 million from the college budget, announced that at the end of this academic year the college would cut the positions of all three chaplains, who serve the Jewish, Protestant, and Catholic communities. In their place, the chapel would develop programs to meet a diverse student body’s changing needs. Students who have worked closely with a chaplain have been concerned about the cutback, noted Dean of the College Maureen Mahoney. Still, a new approach will be more equitable, she said. Walters and Mahoney have been talking with leaders of student religious organizations to find out what kinds of programs to develop, with a particular eye toward multi-faith programming. “Students have spiritual questions and they need to learn about religion, even if they don’t have one,” Walters said. 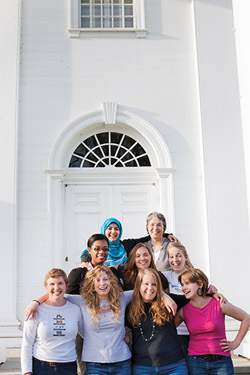 “We need to think about how we help students live effectively in a world where religion matters.” Some of the possibilities, Walters noted, include developing student peer religious advisers, becoming a field education site for divinity students, consulting with Smith’s robust religion department, and working with student organizations to sponsor occasional services. Walters points out that before the chapel opened in 1955, students attended religious services off campus. “The college was founded with the expectation that students could find religious expression in the community,” she said. 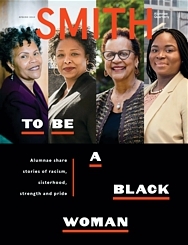 To a degree, Walters noted, students have never stopped finding their own places to worship, from carpooling to Mercy House, a contemporary Christian service in Amherst, to St. John’s Congregational, a traditionally African-American church in Springfield, and Hampshire Mosque in Belchertown; some walk to nearby churches like St. John’s Episcopal, located next to the Smith College Museum of Art. “All of our local churches and synagogues are open to students,” Walters said, noting that local religious leaders serve as ad hoc advisers to the chapel.